I think I know enough to understand how it could work (for example as a joke among the friends) and when asked if I would wear it my answer was "probably if the shirt quality is good and if the print quality is good", still I found it an interesting "design" exercise to take the project seriously and try to help being it as good as it could, like using a monospaced font, terminal colors and keeping the 31337 as low as possible, so the message has a better change to be understood by the target audience. the second case of unpredictability and inconstancy is happening during a new found flame, he will alternate from times at above full capacity when he is overconfident and feeling able to move mountains with times when he is unable to do anything, dropping the focus from geeky stuff to useless things. Exercise: identify a geek around you, evaluate his work level and based on the items above try to determine his relationship status. 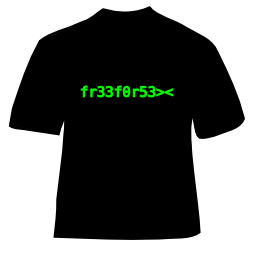 Don't publish the results anywhere, nobody wants to read depressing stats, but if you feel like it, you can make for yourself a "fr33f0r53><" T-shirt, the source is Free. thanks Anonymous, corrected, it was in due time. in many cases i don't correct typos even if when i find them myself because doing so to an already published article will break Planet aggregators, which see is as new. Nuh-huh, sister! I just helped mapleoin to un-fsck the planet by hacking the rss to revert his "three days in the future" post. It's doable, trust me. You just gotta want it. You really have no excuse.